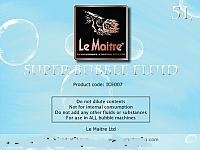 Le Maitre Super Bubble Fluid (4 x 5 Litre) - code ICE007, Le Maitre's Super Bubble Fluid 4 x 5 litre sets high standards. Ready diluted for ease of use, the bubble fluid is used with the Bubble Master range of machines to create dryer, longer lasting bubbles and minimises the residue problems associated with other fluids. The Le Maitre super bubble fluid is colourless, odourless and non-flammable, this liquid is formulated to create the most transparent and vivid bubbles! Suitable for all bubble machines.